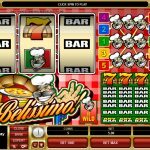 Belissimo is one of the many classic slots which Microgaming has in its offer. The slot is inspired by our favorite food Pizza. The main character on the reels is the Chef who makes the best pizza in the world. The slot has low level animations and simple visual effects, but the symbols are well designed and will leave you craving for food. Even though classic slots aren’t too popular across online casinos they can produce big payouts thanks to the strong pay table and low number of pay lines. 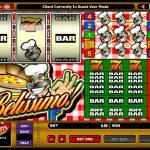 Since Belissimo is a classic slot game don’t expect to find any fancy bonus features on the reels. But the slot does have 5 pay lines in total and the symbols can land stacked on any of the three reels. The Chef symbol is the Wild symbol in the game and he will substitute for all of the game symbols in the slot. The Chef also has the highest payout in the game which can be 1.000, 1.500, 2.000, 2.500 and 5.000 coins of three of them land on the first, second, third, fourth and fifth pay line. This is why it pays out to play the game with all pay lines active. The rest of the symbols in the game have smaller payouts. The Seven awards an 80 coins payout, while the Triple, Double and Single Bars award payouts of 60, 40 and 10 coins accordingly. Any Bars combination will award 4 coins in return. Classic slot games were once very popular across casinos simple because they could produce big payouts. Belissimo has that feature since you can land a full screen of wilds and walk away with the ultimate payout. You stand a chance to win up to 12.000 coins in a single spin in this game which is a payout well worth chasing. Finally a good Native American based slot game you should play! Fire Hawk a 5 reel slot by MicroGaming.